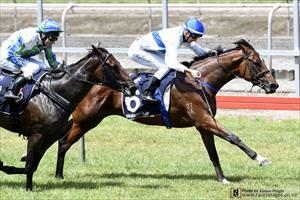 In the white & blue Oaks Stud colours, Bridal Veil (3 f Niagara – Eye Me Up, by Agnes World) saluted at just her second start on 2 February in the Maiden 3YO 1400 metres sponsored locally by O’Reilly’s Motel Matamata. Given time (37 days) following a solid third on debut in the Maiden 3YO 1215 metres at Rotorua, won by subsequent winner and stakes fourth placed Ladynadel (Savabeel), Bridal Veil brought respected form to the race, reflected in starting third favourite and paying $7.60 & $2.30 on the NZ TAB tote. With Shaun McKay in the saddle, Bridal Veil was away smartly to lead before steadying to trail at the 900m. Held up nearing the home turn, with pressure on the lead, she found room near the rail inside the 200m and unwound a strong finish to win well. “She put herself there very easily, but came back to me fine in the trail and although she would probably appreciate better ground it was a good effort,” McKay said. 60mls of rain overnight saw the track rating Slow7, but the 1:24.6, last 600m in 37.0, was indicative of going on the better side. “She’s a lovely filly, although still quite weak, and I thought that might trip her up on a wet track but she’s got a bit of class about her and I’ve liked her from day one,” said co-trainer Pam Gerard. “She’s got a nice way of going and (The Oaks Stud) they’ve been very patient and given me a lot of time with her, so hopefully they’ll give me a bit more. “Shaun (McKay) has done a lot of work for us and he deserves the success,” Gerard added. From a mare, Eye Me Up, that impressed winning three times over 1200 metres and acted with give in the ground, Bridal Veil has inherent ability. Increasingly, in the equine world, there is a school of thought that horses inherit volumes from their dam, and can emulate (or surpass) them not just in ability but also preferences for footing, distances, courses, and even the time of year they are most likely to excel. “She’s got some nice breeding about her, and she’s continued to improve out of sight,” Gerard said. Bridal Veil was strapped by Satyajeet Kuadkikar.